VERY BAD. The hotel looks nice from the outside and in the lobby. That is about it. It's basically a motel. Great Enjoyed my experience in the short time I stayed there. It was just ok It was a bit noisy because location is right off the highway. Breakfast was just something to hold you over. Tub was missing a stopper. Room was cute and quaint ! Good Location The hotel was well priced and close to the areas that I needed to visit during my stay. The breakfast had less variety than I expected to find. The room was kept clean and had all I needed during my stay. Very wonderful stay. The staff were amazing. Would highly recommend! 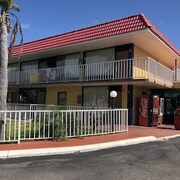 Room was dirty Hair all in the bedding,toilet didn't flush well, I needed room early and was told if by I came in before 2 pm there would be a $35 charge, will never stay here again. To travel is to live, and discerning cheapsters understand you don't require bucket-loads of cash to do it. 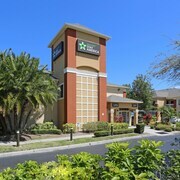 So why don't you make Clearwater your next extraordinary getaway? This city is approximately 190 miles southeast of the capital of Florida, Tallahassee. Clearwater is also 5 miles south of Dunedin. Forget about the star attractions — it's the locals that really make a place tick. In this part of St. Petersburg - Clearwater, you'll find 110,000 of them. You don't have to be an art collector or an anthropologist to spend time at the Dunedin Fine Art Center. Check out their program and decide on one of the free or cheap arts and culture events. When you venture outside your hotel room, it can be all too easy to start tossing around cash. But that definitely won't happen at Eddie C. Moore Softball Complex! It's a fantastic place have some fun in the outdoors. Would you like to delve into the past? If you're interested in understanding the local history through its time-honored sites, put Serenity Gardens Memorial Park on your vacation bucket list. Not eager to fork out cash to get to Sunsets at Pier 60? Why not stroll there and soak up the sights along the way? No matter what you believe in, spending time at religious landmarks is the perfect way to develop your spiritual side. Why not indulge in some soul-searching at Church of Scientology? 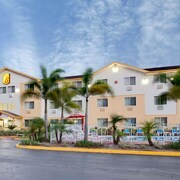 Don't let the fear of squeezing into a cramped motel deter you from embarking on your unforgettable trip. When you arrange your travels with CheapTickets, you won't need to hand over your life savings or sacrifice comfort and convenience. With access to 500 airline partners and around 500,000 properties globally, you can have confidence that we'll seek out the most exciting deals on the market. But it doesn't stop there! If you combine your travel fare and accommodation bookings, you could save as much as $481. Walk away with fantastic value with our Price Guarantee. If you happen to find your package for a better price within 48 hours of making your booking, we'll meet that offer and refund the difference. There's nothing more awesome than being rewarded for pocketing a hot deal. 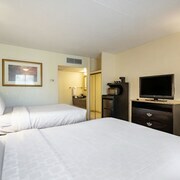 Our simple rewards program allows you to earn cash to use toward your next eligible CheapTickets hotel stay. All you have to do is book your flights! You're just a couple of clicks away from joining a loyalty club that actually has benefits you'll be keen to use! To start accruing savings on all eligible bookings, as well as unlocking special perks and bonus offers, all you've got to do is join CheapCash after you log into your existing account or sign up for free — it couldn't be simpler to save! So, on the hunt for the most economical way of getting about Clearwater? Why not consider car rentals? Visiting a gas station every now and then is sure to be easier on your wallet than spending a fortune on expensive taxis! Why not pick up your car straight from Tampa International Airport? It's a good way to avoid lugging your heavy baggage around any longer than you have to. Thrifty Car Rental and Dollar Rent A Car are waiting to help you out. You might like to rent a ride from Budget at 801 Cleveland Street. They are right in the city center. If there's nothing that suits your needs, Avis at 801 Cleveland St is worth looking into. 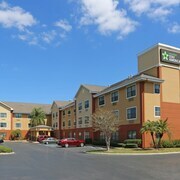 Book your hotel in Clearwater ASAP and begin arranging the remainder of your budget-conscious vacation. CheapTickets presently has 81 available options in this place. You'll have heaps of change clanging around in your pockets if you stay at the Sta 'n Pla Marina Resort or The Beachview Hotel. They're our top budget recommendations.